Our Fresh Baked Cookie Gifts make your customers and employees feel like family! Choose the flavor, occasion and include your personal message. 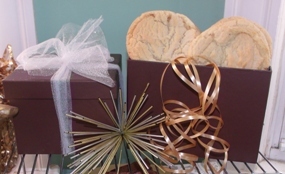 Cookies come in a stylish gift box or basket with matching ribbon. Nationwide Shipping. Local Delivery in the Seekonk, MA area available upon request. Our cookies are always small batch, hand-scooped and locally sourced. Cookies weigh approximately 1.65 – 2.25 oz. each. Large cookies are packaged by the pair and come in easy to store sealed bags. Many diet styles to choose from including old-fashioned, gluten free and vegan. Check out our Cookie Page to get descriptions and ingredient information. House-made ingredients include vanilla extract, vanilla sugar, vanilla powder, apple sugar, banana sugar and lemon sugar. Local ingredients include farm fresh eggs, honey, peanut butter, maple syrup and produce. Don’t see the cookie flavor you’re looking for? Customize It! Want to make it extra special? Personalize It! All products are manufactured in a kitchen that also produces items containing wheat, peanuts, tree nuts, soy, dairy, and egg.